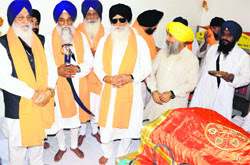 Akal Takht Jathedar Giani Gurbachan Singh (2nd from left) and SGPC president Avtar Singh (left) honour Bhai Gurmej Singh, who transliterated the Gurbani in Braille, in Amritsar. The foundation day of the Akal Takht, supreme temporal body of the Sikhs, was observed with fervor here today. The significant part was that for the first time, the ‘sehaj path’ was performed from the Braille version of the Guru Granth Sahib by Bhai Gurmej Singh. A visually impaired former ‘raagi’ of the Golden Temple, Gurmej Singh had transliterated the Gurbani into Braille. The special holy book is enshrined in Room No. 13 of the Golden Temple complex for the convenience of the visually impaired devotees. The Gurbani’s Braille version has 2,153 pages in 18 volumes with a page size of 11x12 inches. Having retired in 1998 after serving the Golden Temple for three decades, Gurmej Singh had prepared six Braille copies of the holy book. He presented the first of these to the visually impaired children studying at the Central Khalsa Orphanage in Amritsar, the same place where he spent his childhood. 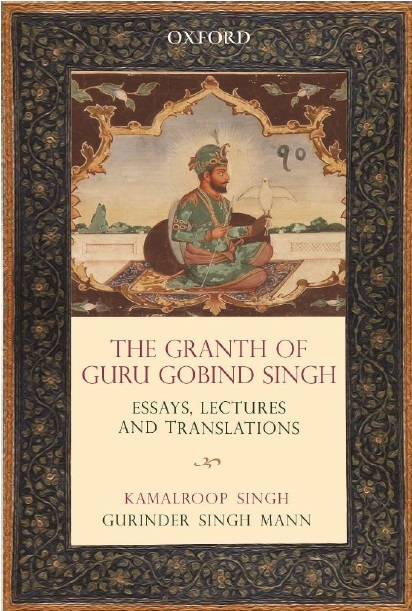 He gave the second copy to the Golden Temple. Gurmej Singh said it was for the first time that the ‘sehaj path’ was performed from the Braille-transliterated Gurbani. “I presented other copies to an old-age home for the blind near Phagwara, a home for the blind at Ludhiana and the Gurdwara Rakab Ganj in Delhi. I kept the sixth copy for myself. It is placed at my house,” he said. Gurmej Singh and his family members were presented with a ‘siropa’ by Akal Takht jathedar Giani Gurbachan Singh and SGPC president Avtar Singh. clipping pathare used to outline objects from the background of an image.